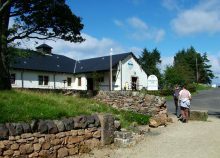 Greenock Cut Visitor Centre Toilets Closed. Greenock Cut's toilets are closed indefinitely due to a burst pipe. Apologies to anyone looking to visit Greenock Cut in the coming weeks, the toilets are currently closed due to a burst pipe. We are working hard with local contractors to recitify the situation but the damage to the ceiling is quite extensive. There will be another post when the situation is rectified. Go Wild on Wednesdays at Greenock Cut!